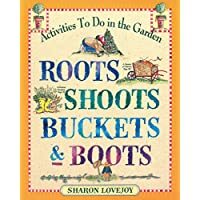 One of my favorite how-to gardening books for children and their adults is Roots, Shoots, Buckets & Boots: Gardening Together with Children by Sharon Lovejoy. It is a source of wonderful inspiration where everyone’s imagination can soar. Involving children in the process of cultivating a garden, growing their own food, understanding the necessary elements involved in growing successfully is really sowing seeds of knowledge and skill that last a lifetime. This book guides you through making a bee hive for Mason Bees, growing a pizza patch, bean tunnels, a night blooming garden, throwing Mother Nature’s Tea Party, creating Harvest Treats for the Birds and Bees, making a Sunflower Playhouse, brewing some Moth Broth, building a worm bin, creating a compost sandwich, making gifts from the garden and so much more. I absolutely adore this book and refer to it often. My hope is to one day have a piece of land to grow food and create a space with flowery mazes and sunflower homes for everyone in our community to enjoy. Perhaps all communities would benefit from creating functional, edible and playful spaces for people to gather, share and thrive. Connecting deeply with nature through an activity such as gardening restores balance; nature is the ultimate healer. Sharon Lovejoy’s idea to use tall flowers as supports for other flowers to wind around got my creative juices going. I want to grow a ‘house of flowers’ for children and adults to while away their warm summer days enveloped in the sensory parade of grass and a rainbow of fragrant flowers, all creating a cool shelter within. Perhaps they can snack on the vegetables straight from the garden, too. Here is an illustration of my plan. There are others out there, a ‘tent’ made with simple sticks tied together at the top with a wide, round base (think upside down cone) with flowers climbing all over the structure. I want to try tying fallen branches together to form a sort of lattice hut that supports a ‘curtains of flowers’. In addition to creating this shelter, I know that our front yard garden will need some shade from the relentless summer sun as well as an attractive aesthetic. We need to create natural shade for some of the vegetables that enjoy the heat but not the direct sun. To achieve this, we have Kong Sunflowers to plant around the entire garden a couple feet apart, tie strings from one Kong to another (once it’s grown) and grow leafy climbers such as Morning Glory or others up the Kong and hopefully across on the string. Using sunflowers and morning glories to create some shade over raised garden beds. It is all an experiment and who knows where it will all lead. But without plans and dreams, where would the future be? All photography by Jane Grueber. See more my photo gallery here.